This season Blue Cross and Blue Shield of Kansas City (Blue KC) and Sporting KC are teaming up to recognize Blue KC Sporting Samaritans, intended to spotlight students and teachers who make our community a better place to live, work and play! 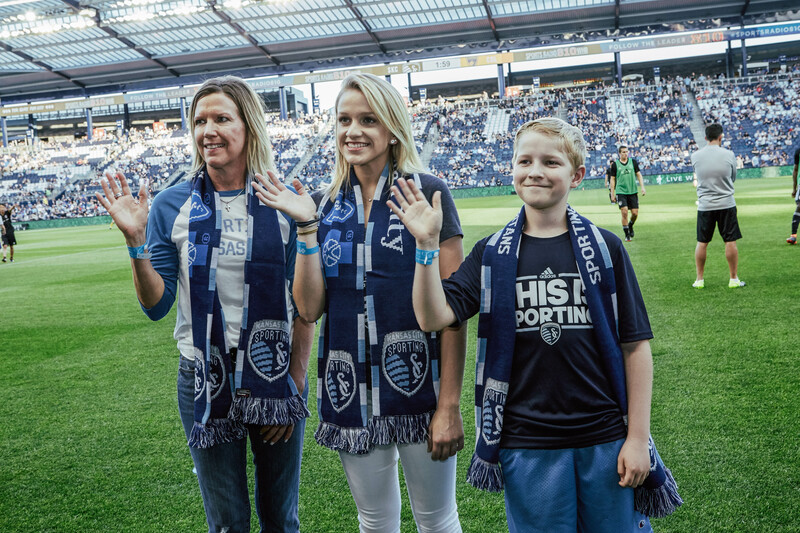 Blue KC Sporting Samaritans, selected from nominations submitted by Sporting KC fans, will be recognized during the pregame festivities at Sporting KC home games at Children’s Mercy Park. The Samaritan and their guests (3) will not only participate in the on-field experience but will also receive a behind the scenes VIP experience, four tickets to the game, a parking pass and a $50 gift card redeemable for Sporting KC merchandise. Each nominator of the selected/chosen Blue KC Sporting Samaritan will receive two (2) tickets to the recognition game, one (1) parking pass and a $25 Sporting Style Gift Card or gift card redeemable for Sporting KC merchandise. Any and all related expenses, including without limitation any and all federal, state, and/or local taxes shall be the sole responsibility of the nominator and/or Samaritan. The Blue KC Sporting Samaritan program is governed by the laws of the State of Missouri and is subject to all applicable federal, state, and local laws and regulations. By submitting a nomination and by participation, nominator, Samaritan, and Samaritan’s guests, if any, agree to release and hold harmless Blue Cross and Blue Shield of Kansas City and its subsidiaries, affiliates, advertising and promotion agencies, suppliers, partners, representatives, agents, successors, assigns, employees, officers, and directors from any liability, illness, injury, death, loss, litigation, claim or damage that may occur, directly or indirectly, whether caused by negligence or not, resulting from nomination or participation in the Blue KC Sporting Samaritan program. Nominator must be 21 years old. All nominations must be submitted at www.sportingkc.com/bluekc. A nominator can only nominate one Samaritan throughout the season. If a nominator submits multiple nominations, only the first submission will be considered. Nominator must provide the contact info, including email address and telephone number of the nominee. Nominator must provide a first-person narrative as to why the nominee should be selected (250 words or less). Nominator must submit the nomination in English. Nominator must agree to be included in a publicity release should his/her Samaritan be selected. A Samaritan may be nominated several times by multiple people, but please remember quality over quantity. Samaritan must live in the Kansas City Metro Area. Samaritan must agree to be included in a publicity release. The degree to which the Samaritan has been a catalyst for a cause that meets basic human needs or enriches the lives of others. The degree to which the Samaritan has exhibited dedication and selflessness. The degree to which the Samaritan has made a special and significant impact on individuals, families or the community-at-large. The degree to which the Samaritan has gone “above and beyond” to serve and inspire others.